Professionally Manufactures Wholesales Fully Automatic Bottle Screen Printer, Fully Auto Bottle Screen Printing Machine, Automatic Bottle Screen Printing Equipment With Flame And UV Curing Systems. The Fully Automatic Bottle Screen Printer, Fully Auto Bottle Screen Printing Machine, Automatic Bottle Screen Printing Equipment With Flame And UV Curing Systems is designed for printing color on round and oval bottles. 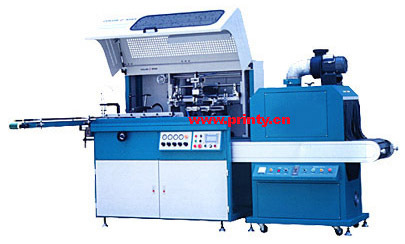 It has the advantage of steady, easy operation, high printing speed, good printing results etc..
Each unit can work as a single color printer, or several units joint together can work as a multi-color screen printer. Flame treatment, UV or hot air drying can be added to the system. By changing essential parts fixtures similar products can be auto printed. Brand-name pneumatic parts are used. Squeegee/flood bar depth, pressure, speed, leveling and stroke, etc. are all adjustable.